East Canyon Reservoir is a large reservoir behind the northern Wasatch Front. 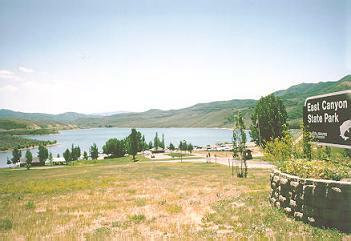 Although vehicle travel along the west side of the reservoir is restricted, the entire shoreline is owned by the state of Utah and public access is unrestricted. Surface: South end of the lake and bays are open. We still have a lot of ice on the north end of the lake. Launch Ramp: Closed. Wedge dock will go in soon. Campground: Dixie Campground is open. Dixie campground is first come first serve. The water has been turned on but the restrooms are not operational. Fishing Conditions: Trout from the shore. Its a perfect time to come up and enjoy the cozy yurts and cabins. Reservations can be made for the yurts, and cabins by visiting our website or call 800-322-3770. ALERT: We will be winterizing our quagga decontamination washer for the season. MORMON FLATS TRAIL HEAD has been repaired, but now is flooded again. We really need to figure out the beavers. From Salt Lake: 17 miles north of Interstate 80 (Exit 134) on State Route 65. 12 miles south of Morgan from Interstate 84 (Exit 103) on State Route 66.